I create brilliantly oddball artwork for you to own immediately (plus time for delivery) – get on over to my Redbubble shop (or Etsy for Misfortune Tellers) to see the full range of hilarious, witty and whimsical goodies in store. They’re great for brightening your day or as fabulously quirky gifts for your friends. 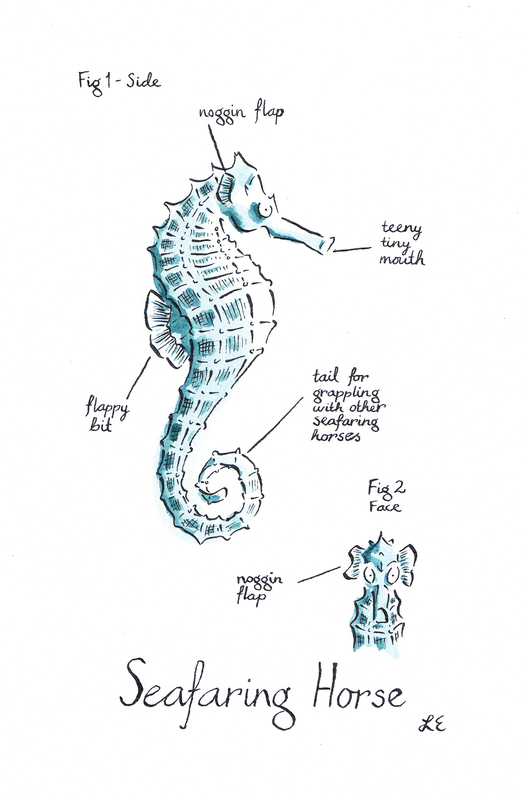 Private commission for a humorous anatomical painting of a seahorse. For a truly magical experience, get bespoke artwork created for just for you. Working with you to fine-tune your requirements, I can craft artworks that are the perfect gift to yourself or a loved one. If you have a project in mind and want to work with me, I’d love to hear about it. To find out what I can do for you, get in touch. The Grain Barge in Bristol between 30th March and 3rd May 2015. Ship Shape Craft Fair on 10th May 2015 in Colston Hall, Bristol.